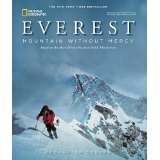 I am so grateful to Louise Rhind-Tutt of www.lrtpublicity.co.uk for a review copy of ‘Everest: Mountain Without Mercy’ by Broughton Coburn in return for an honest review. The book was reissued by National Geographic in August 2015. Initially, in my ignorance at not understanding the background to the book, I wasn’t sure I’d enjoy a book that proclaims it is based on a film, but from the stunning cover photograph to the last word, I was gripped by this sumptuous retelling of the ill fated 1996 expedition. What I found so fascinating is the depth of information given in such a readable and accessible style. There are historical references that bring the story of Everest alive as well as scientific, meteorologic and geographical details that ensure the reader has a brilliant understanding of what is faced by those tackling Everest’s treacherous slopes. However, the most engaging aspects for me are the personal and human stories that underly the text. The descriptions of Seaborn ‘Beck’ Weathers’ injuries from frostbite, for example, made me wonder just how much the human body can endure. It is particularly poignant that he feels what he was searching for in tackling Everest, ‘home, health, family and friends’ he already had without appreciating it fully. There is real tragedy beneath the pages of ‘Everest: Mountain Without Mercy’. If not a single word of text were read, this book is fantastic for the glorious photography alone, but it is again the human element that rivals the beauty of the images of Everest, fabulous as they are, and that holds the most interest for me. The stumps of Andy Henderson’s frostbitten fingers for instance and the intimacy of emotion etched on the face of Jamling as they set out on May 22nd will stay with me for a very long time. If you’re a lover of history and geography, this is the book for you. If you love travel then ‘Everest: Mountain Without Mercy’ by Broughton Coburn will delight you, but most of all, if you long to understand what makes us human and humane and drives us to do what we do, then I cannot recommend it highly enough. I read this when it first came out- along with many others written about that event (and other Everest expeditions & climbing) including the accounts by John Krakauer & Beck Weathers… you’ve done a great job at summing it up. I’ve always been fascinated by not just the adventures themselves but the psychology behind these people driving them on to take on such feats. If that interests you there’s two books by Maria Coffey Fragile Edge & Where the Mountain casts it’s Shadow… both excellent. Lastly, have you seen the movie that came out recently? Highly recommend it if you haven’t.